My GG Grandfather James Light set up his tailoring business in about 1850. He was definitely recorded as having his business at 19 Cranbourne Street, but at what date he moved the business there is not known. His two sons Frederick Parsons Light and Horace Frank Light (my GGrandfather) were working for him along with two apprentices and he is recorded as a Master Tailor employing two men and two boys. James Light did all his work by hand and never used a sewing machine – after retiring he continued to work for his son Fred, who took over the business, as a ‘waistcoat hand’ until a week before he died in 1911. Frederick and Horace continued to run the business after their father’s death. 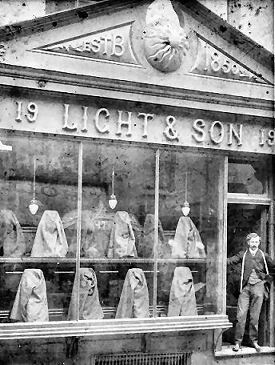 My father’s cousin believes that the gentlemen outside the shop in the photo is Horace Light, as he certainly managed the business for his brother at some stage and we estimate that it was taken about 1911, following James’s death. I am not sure when the business ceased to trade but Horace died in 1939 and none of his children carried on the business. The street directories for 1925 and 1927 show #19 as still a tailors- ‘PG Terry’; however the directories in 1934 onwards show the numbering finishing at #17. In the late 1920s and early 1930s the west side of West St was demolished and the building line pushed back. It now presents a late 1930s commercial appearance but sadly without the Light & Sons premises. A case of many Lights making hands work! Thanks Andy (12/02/13). Yes, James, George and another brother Eli (bootmaker) started their businesses in Camelford Street (see Places). James moved from Christchurch, Dorset to Brighton and then established his business in 1850 before moving to different premises. James’s Park Road West address was the family home I believe.